Through music and fellowship, we support a dementia-friendly community. Beginning in early 2017, a group of volunteers gathered to bring a new chorus to Rochester. Following advice from the creators and leaders of Giving Voice – a successful organization based out of MacPhail School of Music in Minneapolis – Resounding Voices was born. 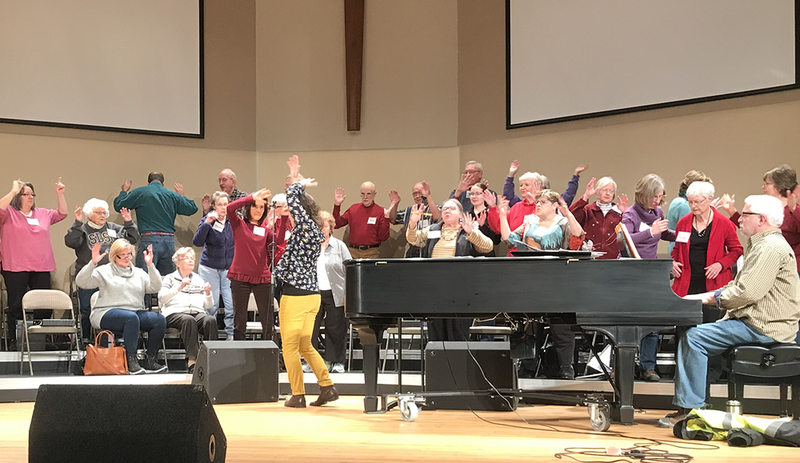 Resounding Voices is a chorus in Rochester, MN, for those community members who are experiencing mild memory impairment or dementia, and their support partners. Having completed two semesters, the power of music to unify, support, and strengthen minds and relationships has been amazing to watch. The Resounding Voices chorus rehearses weekly in 10-week semesters with incorporated social time. Music is selected and adapted so that there is a mix of familiar and new, all toward the goal of successful public concerts at the end of each semester. Socializing is an essential part of each rehearsal, encouraging supportive friendships to grow. Dementia-aware, trained volunteers provide support so that all members of the chorus can fully participate in the experience. In addition to regular concerts, the chorus is available to perform at other community events. Please explore our website for more information on how to register to sing as a team or as a volunteer, or contact us.